Posted by Mike C. in Internet, News, Personal, Photography, Politics, TV, Weather. 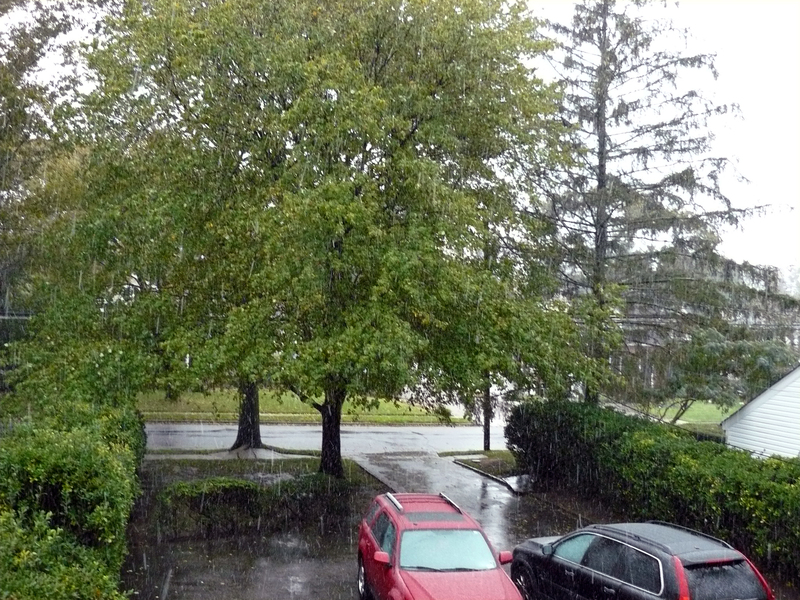 What was billed as “Snowtober” was “Rain-and-snowtober” or “Wintry mix-tober” in Wantagh for much of yesterday and last night. Just to the north and west (within Nassau County), more wet snow fell. 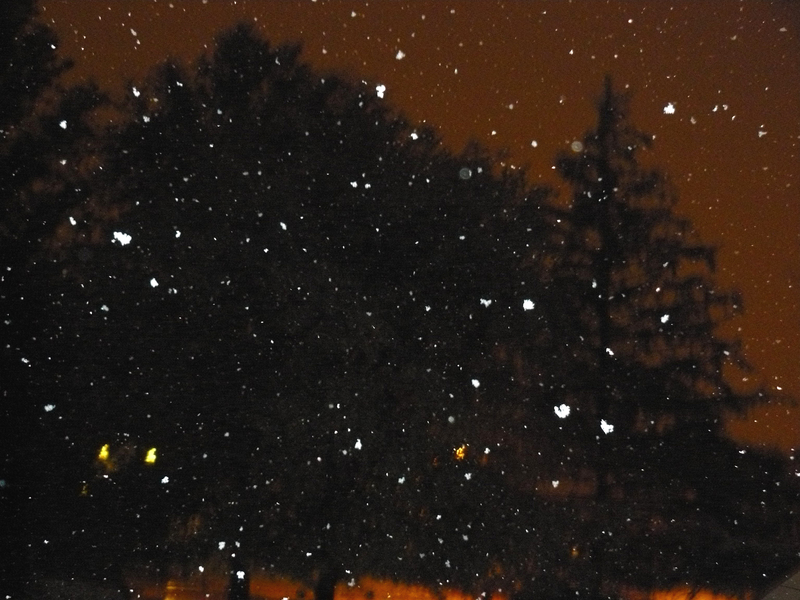 The precipitation changed to all wet snow after 11PM. What fell at my house only stuck to the cars in the driveway and to parts of the grass. Any cold surface accumulated snow. A bigger concern for me was the strong gusty winds. The National Weather Service issued a High Wind Warning for Nassau and Suffolk until 6:00 this morning. This was, after all, a Nor’easter. So between that and wet snow accumulating on tree limbs, I feared downed trees, limbs, and power lines. 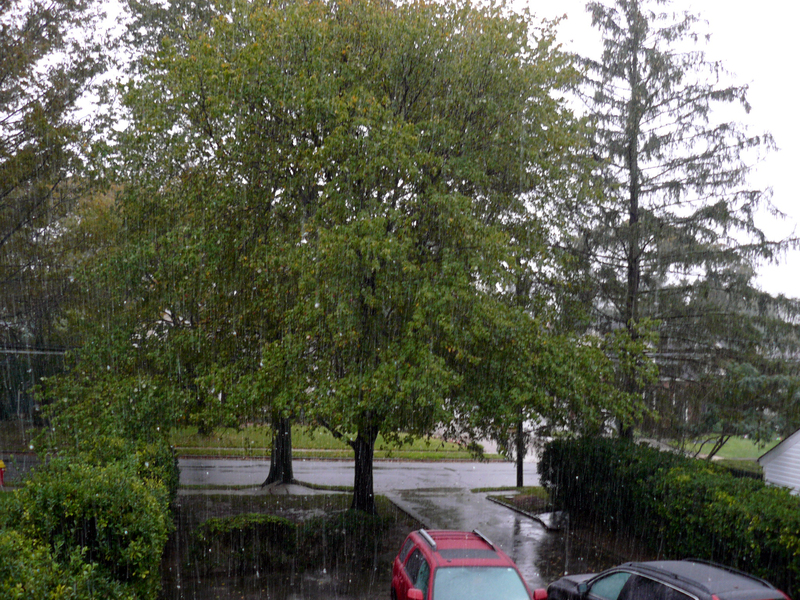 I simultaneously flashed back to the Nor’easter of March 2010 and Irene of nine weeks ago. But the worrying was for nothing. The winds died down early this morning and the power never went out. That’s not to say it didn’t go out elsewhere on Long Island, but it wasn’t on the scale of either storms I flashed back to. I wish I could say the same for people north and west of the Island (2/11/13 UPDATE: The page I linked to in the previous sentence no longer exists). BRIAN WILLIAMS, anchor: Everybody out East said the same thing about this freak snowstorm, “This kind of thing didn’t used to happen. This never happened before.” And while that is true, it may also be true that we’ll all have to start getting used to this kind of thing over the long haul. A record snowfall of 6.0 inches was set at Bangor, Maine, on Sunday. This broke the old record of 5.0 inches set back in 1963. The point being that it does snow in this region in October. One can only imagine what kind of storms hit this region during the Little Ice Age of the 16th through 19th centuries. But since Williams and Thompson weren’t alive, and snowfall records began in 1869, weather events earlier than that seem unimportant. This of course is common for climate alarmists, so we shouldn’t be the slightest bit surprised. In their view, whatever is happening today couldn’t possibly have happened before records starting being kept, and therefore all weather events outside “the norm” are considered extreme and therefore proof of climate change. You think those still without power in Connecticut, New Jersey, and other affected areas care about that? Of course not. They just want their power back. Nineteen inches of snow in October? Even WCBS 880’s cautious chief meteorologist Craig Allen couldn’t believe what he was seeing. “There’s no way you can play this down based upon these weather maps. Almost everything is in agreement,” Allen reported. 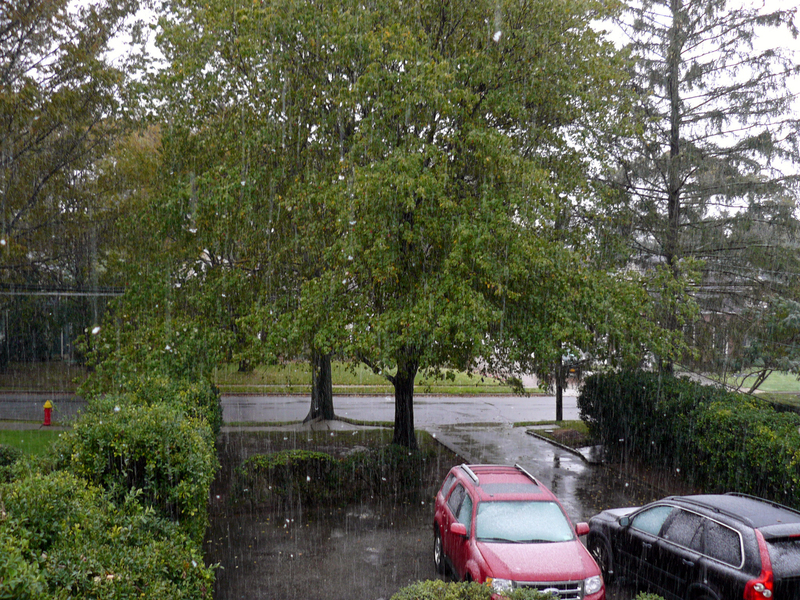 And these flakes were falling on full foliage. All it took was a couple of inches of snow to start bringing branches down. Hundred-year-old trees snapped like twigs. 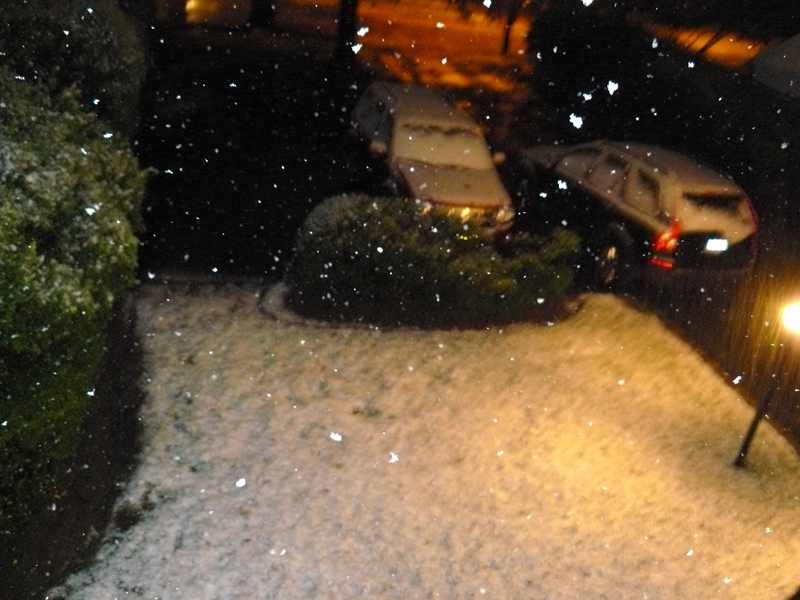 Mother Nature’s mischief night was the Halloween snowstorm of 2011. Posted by Mike C. in Comedy, Commentary, Internet, Media, News, Personal, Politics, Radio, TV. Next Saturday, Bill O’Reilly and Dennis Miller will kick off the Bolder & Fresher Tour at the NYCB Theatre at Westbury. It’s the sequel to the Bold & Fresh Tour with Bill and Glenn Beck. Bolder and fresher than ever before… Bill O’Reilly, godfather of “no spin” and in-your-face television, and Dennis Miller, the king of references and rants, are teaming up to take the country by storm! Your town may never be the same. I will be in the audience next Saturday. I can’t wait. 8/21 UPDATE: Here’s my recap of the show. Posted by Mike C. in Commentary, Jazz, Media, Music, News, Personal, Politics, Radio, TV. Shortly after 9PM, I learned that Keith Olbermann had done his last show with MSNBC. At first, I was in denial. Without knowing the details, I figured he wouldn’t be gone long, as was the case when he was suspended in November. But there won’t be a reprieve for him this time. This is really the end. Effective immediately, I am stepping aside from “Evening Jazz” on 88.1 WCWP. I wish the best of luck to those involved with the format. It was a privilege to be on board for the first seven months. It was equally an honor to be considered as a host when the format was proposed a year ago. I stand by what I said then. I will admit that I’ve had bitter moments since the decision. No one likes to step away from something they love, but that’s the business of media. I wouldn’t have been part of “Evening Jazz” had it not been for Martin Phillips, who I trust has done a fine job in my place. There is one glaring difference between Olby and me: I didn’t use my show to lob personal attacks at my competition or people I disagreed with politically. For that, I did not like Keith, after loving his work at ESPN and Fox Sports earlier in his career. I’ll never forget how listening to the audiobook for The Big Show by Keith and Dan Patrick got me and my family through the car ride to Florida in December 1997, or how listening to the same audiobook got me through an hours-long power outage in September 1998 (though not days long like last March’s Nor’easter). That made it hard for me to suddenly dislike him beginning in 2006 when he took liberal blog-inspired shots at Bill O’Reilly. Then, I discovered Olbermann Watch, where Keith’s misinformation and embellishments were questioned and debunked. It dulled the pain of the personal attacks, unless I witnessed them while recapping segments for the site. To the chagrin of his fans, to recap what I said at the top of this post, tonight was the end of the line for Keith Olbermann at MSNBC. You can watch his farewell here. I don’t know where either of us will end up next, but for my sake, there must be some place out there for me. I hope I don’t regret posting this. @MikeChimeri Yin and Yang. A good guy loses a job, and, tho it takes a while, a villain gets his comeuppance. You’ll find work B4 he does. I replied by thanking him for the support. Check out his site’s links for today. Since the announcement, it’s been Olbycentric. 1/22, 12:55 AM UPDATE: J$’s weekend thread has more Olbycentric links. 1/22, 5:39 PM UPDATE: The final Olbermann Watch post…for now. From NewsBusters, it’s Keith Olbermann’s greatest hits. Despite Keith’s departure from MSNBC, Bill O’Reilly still won’t mention his name on the air, as we saw tonight on The O’Reilly Factor in the Weekdays with Bernie [Goldberg] segment. Jeff Poor elaborated on that move at The Daily Caller. It’s a good move because Olbermann still has Twitter to snipe back on and rally his base. The new #FOK, or “Friends of Keith,” hashtag is one way that base is rallying. 1/26 UPDATE: Hal Boedeker of the Orlando Sentinel replied to Goldberg today. 2/8 UPDATE: Keith is headed to Current TV. With that, attacks on everyone he disagrees with will resume. 3/30/12 UPDATE: Keith Olbermann was fired by Current TV earlier today. Posted by Mike C. in Golf, Personal, Politics, Sports, TV. The last of the Presidential debates between Democratic nominee Barack Obama and Republican nominee John McCain will be held tonight at Hofstra University in Hempstead. Last night, I actually considered going over there this afternoon, but I need credentials. So much for that. A venue I was able to get into – after buying a ticket, of course – was the PGA Champions Tour’s Commerce Bank Championship, which was held at Eisenhower Park’s Red Course. As I documented in the post I’ve linked to, I appeared in a few crowd shots toward the end of Golf Channel’s coverage. Back to the present, this was basically a post I felt obligated to make since the debate is about 25 minutes away from my house…barring heavy traffic, which there no doubt is.